A Different Dimension traces the historical development of an expanded, transpersonal view of consciousness—a view that sees the human mind as reaching beyond individual, personal consciousness into realms that we call “spiritual.” It provides a rich and vital discussion of some of the most fundamental questions of our lives: questions about the nature and capacities of the human mind, and its relation to ultimate realities. While scientifically informed, transpersonal thought challenges common assumptions of our dominant, materialistic intellectual consensus, which sees all consciousness as a product of brain function. While sympathetic to mystical experience, it seldom endorses mainstream systems of religious belief; rather, it provides intellectual substance to the trend referred to as Spiritual But Not Religious. 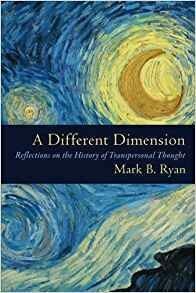 Focusing on key figures and their seminal ideas, Mark Ryan presents a clear and graceful account of this current in psychology, from before the discovery of the unconscious in the late 19th century, through the emergence of transpersonal psychology as an organized field in the late 1960s, to its reverberations in our contemporary world. For 22 years, Mark Ryan taught American Studies and History at Yale University, where he was the long-term Dean of Jonathan Edwards College. Subsequently, he was Titular IV Professor of International Relations and History at the Universidad de las Américas, Puebla in Mexico, where he also served as Dean of the Colleges and Director of the graduate program in United States Studies. For 14 years a Trustee of Naropa University, he is certified as a practitioner of Holotropic Breathwork. Currently he teaches at the C.G. Jung Educational Center of Houston, the Wisdom School of Graduate Studies of Ubiquity University, and other venues.